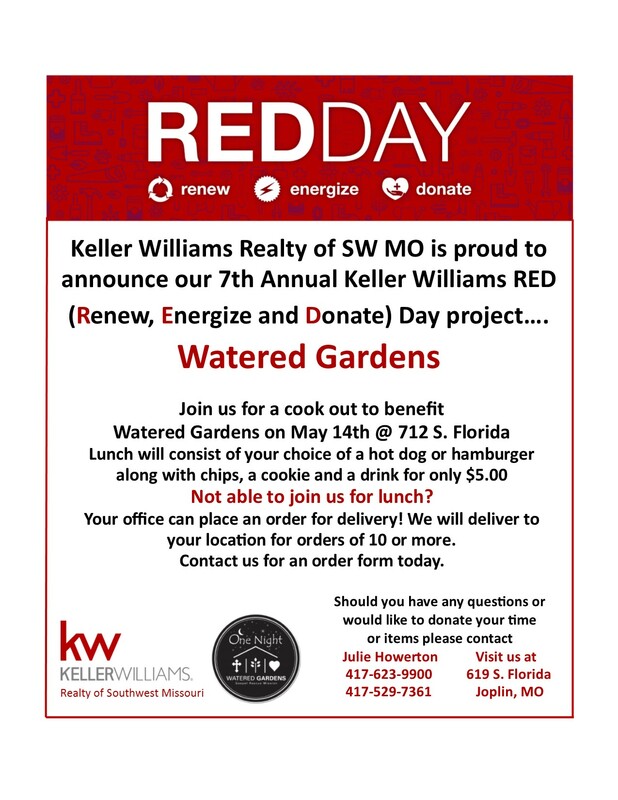 Each year our Keller Williams agency has Red Day. On this day, our agency focuses on a community project that needs a little extra help. In the past we have remodeled and bought extra supplies and equipment for Lafayette House, Boys and Girls Club, and the Webb City CP Center, to name a few. This year, we are helping Watered Gardens. This is a highly regarded agency that helps the disadvantaged in the area. Some of the ways that Watered Gardens serves the poor is by providing shelter, meals. food, mentoring and job placement. So you can see why this year we are super excited to help this place. We have big plans to add furniture, storage, lay carpet, paint offices, plumb the baptismal font, plant flowers and supply 2 very large bike racks, and more!. One way we are able to do all this is with the community help. We partner with many of our affiliates to get the job done. We also sell a hot dog or hamburger lunch to raise funds. Here is where you can help. You can purchase one of these delicious lunches on May 14. If your office orders 10 or more lunches, we deliver. $5 gets you a fresh off the grill hot dog or hamburger, plus chips, a cookie and soda! YUM. Just give me a call (417-825-1042) to place your order. And then enjoy!